Join us for our monthly tastings at Liberty Harbor. Join us this month to enjoy and explore spirits from Newark distillery All Points West . The Common Market Farm Share will be there as well with information and samples for visitors. 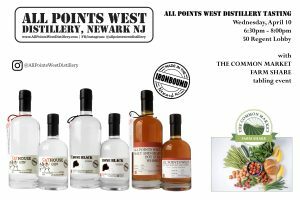 All Points West—named after the old Jersey Central railroad that connected the ports west of the Hudson to the rest of continental North America—provides a Trans-Atlantic take on each small-batch of spirits they create. Historic techniques from the Netherlands, Ireland, Scotland and Britton, which enabled immigrants from those countries to found dozens of successful distilleries and breweries thought the region (including 26 in Newark alone), are married with American approaches. The resulting spirits are innovative and crafted with care in small batches in Newark’s Ironbound, only 6 miles from America’s first distillery. The Common Market partners with farmers who share our commitment to sustainability and transparency. We purchase directly from over 80 producers throughout the Mid-Atlantic, all within 250 miles of our Philadelphia warehouse. Our procurement team provides technical assistance to help scale the capacity of small and beginning farms. We educate, deliver and connect institutions and communities to local, sustainable foods. Our Outreach Team collaborates with chefs, wholesale food purchasers and wellness professionals to build a successful local food program. We promote transparency in the food system by identifying the source of every product we carry so our customers know exactly how the food is grown and where it’s coming from.